Wonton mee, a common breakfast, lunch & dinner for Malaysian, it has the soupy and dry (gon loh) version. I personally only ever liked the gon loh version, only GOD know how many times I have tried to replicate my favourite gon loh mee at home after moving overseas. 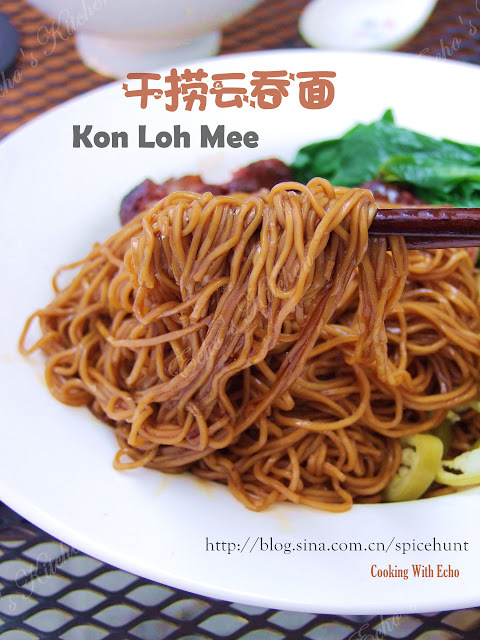 I tried so many different combinations of sauces and search through the net for the recipe of a good plate of gon loh mee for the longest time. I have to say all my attempts turned out OK, not the same, just OK. I can't seems to figure out what is missing and I don't like to settle for OK, not for something I really liked at least. So the next time when I visited Malaysia, I made sure to pay extra attention to the way wonton mee is made when I visited my favourite store. I figured out the shallot oil the pork lard and the pepper powder part, but never quiet able to learn the secret of that pot of dark sauce they used. I resolve to find a formula that pleases my palate and it should be close enough to called it authentic gon loh mee. It took me so many close, not quiet close and very close attempts to finally come up with a Gon Loh Sauce that tasted like the gon loh mee I liked back in Malaysia! I must say one thing ahead though, the sauce is not the only thing to a good plate of gon loh mee, crispy pork lard, shallot oil and the pickled green chilies are all key ingredients, one missing, the gon loh mee will not be the same. I am sure many fellow Malaysian will agree with me on this. 1. Place all ingredients listed under Gon Loh Sauce in a mason jar, lock the lid and shake the jar vigorously until all sauces well blend together. Note：This sauce could be kept in the fridge for 1-2 months. 2. In a bowl, place the crispy pork lard with some lard, fried shallot and oil, a pinch of pepper powder, 2 tbsp of hot soup/stock and 1 1/2 tbsp of my special Gon Loh sauce. 3. Bring a pot of water to boil, at the same time fill a large mixing bowl with cold water, place it near the hot pot. Cook wonton/egg noodle in the boiling water for 60 seconds, take it out immediately and place it in cold water, loosen it using a fork or chopstick, using a slotted spoon or strainer, place the noodle back into boiling water again, this time cook for 45 seconds. Take the noodle out, drained and place it into the sauce prepared earlier, mix well. 4. Sliced Char Siu, blanch green vegetables and place both over noodle. Serve with wonton soup and pickled green chilies.